Mercure Hotel Frankfurt Eschborn Helfmann Park. Book now! The 4-star Mercure Hotel Frankfurt Eschborn Helfmann-Park is located in the prosperous economic hub of Eschborn, next to the metropolis of Frankfurt am Main. All 179 rooms have air conditioning and free WIFI. The exclusive meeting area on the 5th floor with its skyline view has 7 rooms for up to 180 people. Arrival: Frankfurt main train station is just 5 miles (8 km) away and the airport is 8.1 miles (13 km) away. By car, take the A5 highway. The economy of the Rhine-Main region benefits from Eschborn; in turn, the expanding city of Eschborn benefits from its location within the Frankfurt region. A win-win situation that offers great business opportunities for you. We wish you every success! 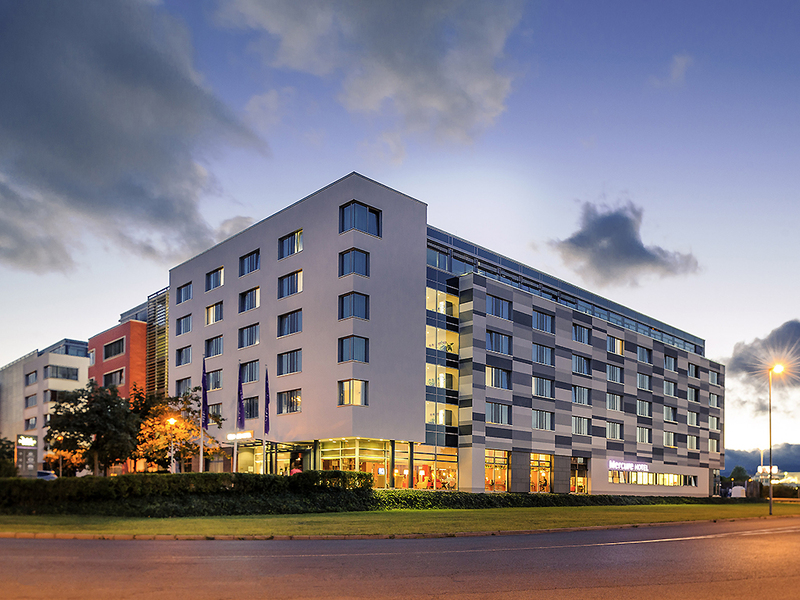 The 179 modern rooms in the 4-star Mercure Eschborn Helfmann-Park are air-conditioned and have WIFI and DSL connection. Many of the Standard and Privilege Rooms feature views of the skyline. One child aged up to 16 years may stay free of charge in yo ur room. If you are staying with family, we recommend our spacious family room with two separate sleeping areas and connecting door. Your pet is also welcome (EUR 10/night). 1.chair is no be well 2.no note to me for pay the fee before ,Just stopped my room card. Good, no issues polite staff everywhere always on hand to assist as needed. Rooms are clean and functional for a business trip. Someone steal my bag during breakfast. Canteen is not secure enough. Convenient check in check out. All amenities, clean, friendly service--all what one needs. hotel is ok, young lady in reception is not so friendly, always showed a cold face to guests. It was unprofessional and much unexpected treatment from such 4 star International hotel at Frankfurt. With reference to my hotel stay at your hotel Mercure Frankfurt Eschborn Helfmann Park-1 during 29th July 2018 to 4th July 2018, Following things had happened with me and I felt very embarrassed in this situation. I was coming to Germany first time after completing my 9 and half hours journey from India and there was poor cooperation from the hotel staff in spite of understanding my difficulty. It was unprofessional and much unexpected treatment from such 4 star International hotel at Frankfurt. With reference to my hotel stay at your hotel Mercure Frankfurt Eschborn Helfmann Park-1 during 29th July 2018 to 4th July 2018, Following things had happened with me and I felt very embarrassed in this situation. I was coming to Germany first time after completing my 9 and half hours journey from India and there was no cooperation from your staff in spite of understanding my difficulty. 1) From your hotel I got an email from Sandra-Lisa Scheffczyk Reservation Agent saying that there will be free shuttle bus for you on the Eshborn Sud railway station to Hotel Mercure, but actually there was no bus available due to Saturday. If your staff is knowing about this that there is no shuttle bus on Saturday then why did they wrongly communicated to me. Because of this I was waiting for the bus unnecessarily for one hour and then started walking as per one good person's recommendation to hotel (who met me on the road luckily, otherwise entire road was empty and was desperately looking for someone to help since my mobile sim was not working due to technical problem) 2) I have been charged unnecessarily on 29th July 2018 @ 9.60 Euro for breakfast. I had booked my room for accommodation only before my arrival to hotel by paying amount in advance. I had booked my breakfast on 29th July evening (after my arrival to hotel) from next day onwards i.e. 30th July to 3rd July 2018. Also my arrival was on 29th July 2018 after 12.00 pm ( you can verify from your record) and as per breakfast time ( up to 10.00 am ) it was already closed so there was no question on taking breakfast on that day, but 9.60 Euro has been charged for the same. I had discussed with the receptionist in detail while doing billing and she also agreed on this point and told us that she will discuss with the Manager on 6th July 2018. But the Manager of the hotel clearly mailed me not to adjust this amount. 3) There are three Mercure hotels in the Eshborn Sud area and Customers like me who are travelling first time to Germany are bound to get confused. I also got confused and reached to a different Mercure Hotel. From there, Mecure hotel staff could have organized something for me to take me to right hotel but they called taxi without telling taxi driver the right Mercure hotel which I had booked. The taxi driver took me again to the wrong Mercure hotel and charged 10 Euro for just 2 min. travel. It was so harassing situation for me to come to wrong Hotel second time. From there one hotel person guided me to reach to right hotel along with heavy baggage in my hand. 3) After reaching to hotel completing tiresome journey of 9.5 hours, receptionist gave me room no.434 and I took my baggage to reach to same room. After reaching to room, I was shocked to see the room condition as it was not prepared for check in, bed was not clean and was not kept properly. Air condition was not working and room was very hot, looking into this situation, I requested to give another room to reception. On this, instead of sending someone to me with new room key , receptionist asked me to come at ground floor to collect the key for new room. So again I came down with my heavy baggage to ground floor and collected the key. It clearly shows that how much you are concerned about Customers and their hospitality. 4) After completing my hectic journey and after so much hassle, finally I got the new room and I wanted to take coffee for refreshment, but unfortunately coffee machine was not working. I had requested the reception to attend the problem of coffee machine but she told that there is no one available to attend this problem so it will be attended only on next day morning. Dear Sir, after experiencing such bitterness, Can anyone expect such unprofessional and rude treatment from such a well-known branded 4 star International hotel? It is a big question mark on the Hospitality Services from such well known Star Hotel. I am working in the Corporates and from our organization, lot of people stay in your hotel in Germany as well as in India and other countries. And with this experience I am sorry to say that I will definitely not recommend others to take your Hotel Services. Good experience, as any time before. Employees are kind, respectful and helpful. The stay was ok, but I have a little complaint. I have booked a double room for 2 people and there was only one sweet surprise on the bed. Another point was the breakfest. Some food which was running out would not be refilled. The bed in standard room(within 2 bed ) is too small to me. The breakfast's quantities are constantly. Very good hotel, great rooms, fine food great bar, so great! The room was ok but the hotel is a bit far. I was not informed where the breakfast is...reception was not that good. I stayed there 2 nights for business purpose. The premium room at special price I booked in advance was not available on my arrival. Instead I got a standard tiny room with bugs - I could move to another standard room after I did complain. No iron or iron board in the room, you must go to the 3rd floor in a Iron room. Not convenient when you are on business trip and stay several nights if you need to iron shirts etc. Breakfast costs a fortune really for such a poor quality and so little choice. Very disappointing. And in the end, I was over charged with the invoice whereas I had to stay in a room of lower standard than the one I originally booked. I complained online to Accor. Noboby never came back to me. I do not recommend at all that hotel- the customer service is absent - you are just a number paying for a room. No matter how bad is the service.